Definition at line 47 of file game.h. Definition at line 54 of file game.cpp. Definition at line 60 of file game.cpp. Definition at line 63 of file game.cpp. Referenced by Engines::KotOR2::Functions::actionStartConversation(), Engines::KotOR2::Functions::assignCommand(), Engines::KotOR2::Console::cmdExitModule(), Engines::KotOR2::Console::cmdFlyCam(), Engines::KotOR2::Console::cmdGetPCRoom(), Engines::KotOR2::Console::cmdListRoomsVisibleFrom(), Engines::KotOR2::Console::cmdLoadModule(), Engines::KotOR2::Console::cmdPlayAnim(), Engines::KotOR2::Console::cmdShowTriggers(), Engines::KotOR2::Console::cmdShowWalkmesh(), Engines::KotOR2::Functions::delayCommand(), Engines::KotOR2::Functions::getFirstPC(), Engines::KotOR2::Functions::getModule(), and Engines::KotOR2::Functions::getObjectByTag(). Return a list of all modules. Definition at line 155 of file game.cpp. References Common::FileList::addDirectory(), Common::FileList::begin(), ConfigMan, Common::UString::empty(), Common::FileList::end(), Common::UString::endsWith(), Common::FilePath::getStem(), Common::UString::size(), Common::UString::toLower(), and Common::UString::truncate(). Definition at line 139 of file game.cpp. 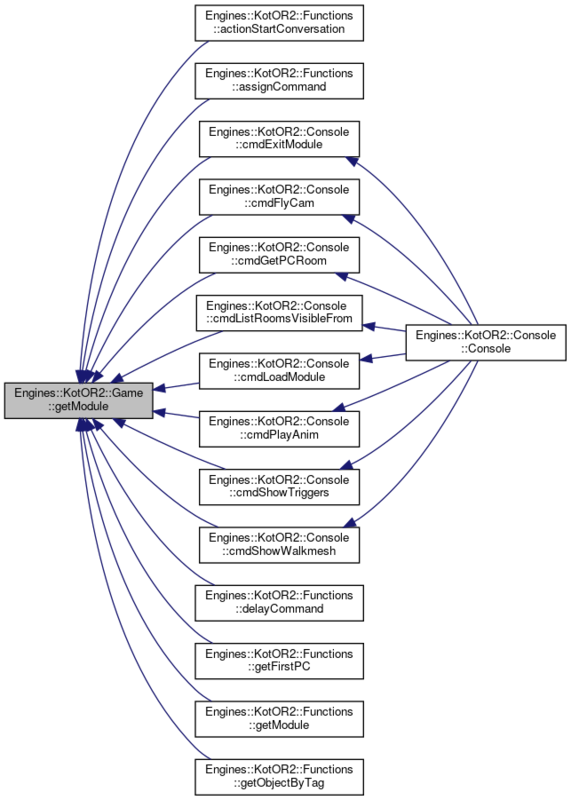 References _console, _module, Engines::Console::disableCommand(), Engines::Console::enableCommand(), EventMan, Engines::KotOR::GUI::hide(), Engines::GUI::run(), and Engines::KotOR::GUI::show(). Definition at line 104 of file game.cpp. References _menuMusic, Common::UString::empty(), Sound::kSoundTypeMusic, Engines::playSound(), and stopMenuMusic(). Overwrite all currently playing music. Definition at line 117 of file game.cpp. References _module, Engines::KotOR2::Area::playAmbientMusic(), and playMenuMusic(). Definition at line 69 of file game.cpp. References _console, _module, EventMan, mainMenu(), and runModule(). Definition at line 80 of file game.cpp. Definition at line 113 of file game.cpp. Referenced by playMenuMusic(), and stopMusic(). Force all currently playing music stopped. Definition at line 129 of file game.cpp. References _module, Engines::KotOR2::Area::stopAmbientMusic(), and stopMenuMusic(). Definition at line 74 of file game.h. Referenced by mainMenu(), and run(). Definition at line 67 of file game.h. Definition at line 70 of file game.h. Definition at line 76 of file game.h. Referenced by playMenuMusic(), and stopMenuMusic(). Definition at line 69 of file game.h. Referenced by getModule(), mainMenu(), playMusic(), run(), runModule(), and stopMusic(). Definition at line 72 of file game.h.